- Normal and simply Windows User interface. - Simply open a media file as you do it in Word or Excel and show it. - You can open more than one media-files (video, audio and pictures) together. - When you open a file, all files with those extention will be automaticaly imported in an Access-database file (mdb). - No limits for a database of media files, you can hold a million and more media files in a Table. - You can sorting media files by name, size, directory, date of creation, extention. - You can play a list of media files (video, audio or mixed) sequently. 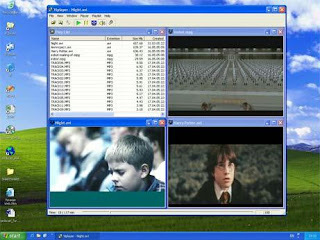 - You can play vob, avi, bmp, jpg, mid, mp3, mpg, wav, wmg, wmv media files. ESC - to return back from Full-screen mode. Shift, Ctrl - to select more then one files in the Playlist. Ctrl + A - to select all files in the Playlist. Enter - to play a selected file in the Playlist. Delete - to delete selected files from the Playlist. Numpad "Plus"- to increase a Time-delay between a pictures. Numpad "Minus"- to decrease a Time-delay between a pictures. - Drag the progress bar below for positioning a media file. - Klick a column headers in a Playlist for sorting it. - Open more then one Playlist and sorting each of them. - When you open a media file, all files with that extention will be imported from directory in a Playlist.